Farm to table: the rugged elegance of a Chevy captiva sport vehicle. I drive my 2012 Chevy captiva a minimum of 50 miles per day as I commute to work and/or run errands around town. It is reliable and comfortable and very easy to drive. It is easy to park and has great visibility through all sides of the vehicle. I live out of town a bit and have 2 miles of gravel road and driveway up a hill in order to get home. This car handles all of the ruts and potholes brilliantly. It is roomy enough to hall bags of feed from the farm store and still stylish enough to drive to a restaurant downtown. I love the Bluetooth capability and the way all the seats fold down so that I can use the full length of the interior of my car to haul treasures I find when I go antiquing. Another feature I really like are the sound system/Bluetooth controls that are on the steering wheel. The parts are not easy to come by. It is definitely reliable. Great on mileage, as well as maintenance. The only issues seem to be electric. Fuses, wires, and things of that sort. Which I have had to repair and replace numerous times. It is very comfortable and roomy for a smaller SUV. Handling is very smooth. Parts for replacement such as the rear high mount brake lamp or harder and more expensive to purchase since the vehicle is not as common. Overall, great car, minus the repair if something goes out. 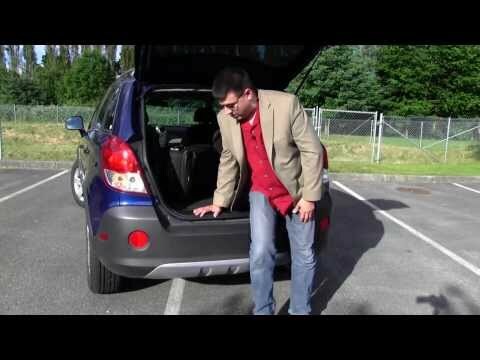 2012 Chevy Captiva sport - wonderful! I love my Captiva! There are virtually no blind spots and the only maintenance I have needed is a new battery and oil change! I get decent gas mileage and I love that I can fit a lot into the back of it! I find it very comfortable for long and short distance road trips. Even my boyfriend who is a big car guy is impressed with how well it drives and how comfortable and easy to drive it is! GENERAL MOTORS (GM) IS RECALLING CERTAIN MODEL YEAR 2011-2012 CHEVROLET CAPTIVA VEHICLES MANUFACTURED FROM OCTOBER 2, 2009, THROUGH APRIL 21, 2011. DRIVING THE VEHICLE WITH THE TRANSMISSION IN MANUAL MODE AND IN FIRST GEAR CAUSES THE ENGINE AND POWER STEERING PUMP TO OPERATE AT HIGHER SPEED THAN IS TYPICAL. INCREASED PUMP SPEED GENERATES HEAT THAT IS TRANSFERRED TO THE POWER STEERING FLUID AND CAN RESULT IN POWER STEERING FLUID TEMPERATURES THAT APPROACH THE POWER STEERING PUMP RESERVOIR&#146;S MELTING POINT.